There he sits...eagerly waiting for her to arrive and the veil to be raised. 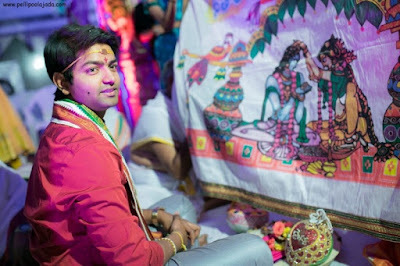 So that he can fill his eyes and heart with the image of his love in the stunning bridal avatar. Here she arrives, sitting in a decorated bamboo basket with a coconut in her hand. The basket is carried by her maternal uncles till the main stage, where she steps out of the basket and sits on the other side of the veil. This is generally observed in telugu weddings. Have you ever wondered why the entry of bride is picturized this way? 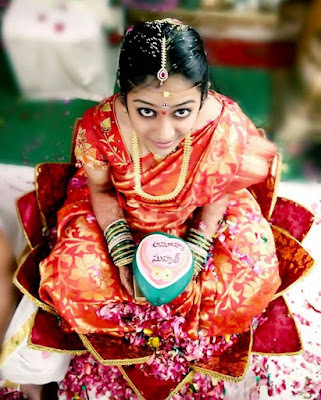 During the wedding Groom is regarded as god Vishnu and the Bride as Goddess Lakshmi. Lakshmi, the goddess of wealth, fortune and prosperity is symbolized as seated in a lotus. As a representation of lotus, bride is made to sit in a hand weaven basket. When visiting the temple to pray to the god, we do not go empty handed. We take fruits, flowers or a coconut to offer to the idol. 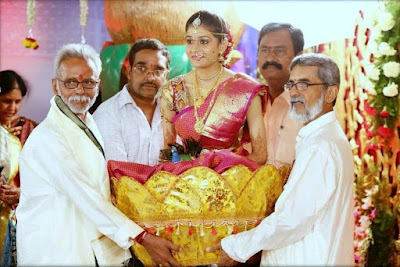 In the similar way, the bride when approaching the groom who is seen as Vishnu, carries a coconut in her hands.